This project enables people wanting to gain work experience in Europe, a chance to do so. It facilitates the exchange of practices for training administration and is also a lever of choice to implement new tools and training methods in order to extend their application to the European level. The first thing you notice when you arrive in England, is they drive on the left, and not right hand of the road. This immediately puts English culture into context. Added to the excitement of arriving, is the discovery of the host families, providing you with a rich emotional landing. The first week, a very overwhelming week, we discover the city , the operation of yellow buses , the local people etc … One thing that surprised me as it is the diversity of the city. One can find lots of different nationalities, Spanish, French, Japanese, Korean , Moroccan, Algerian etc … We also discover the school and World Choice Education. Again we take a lot of new things on board, and some adjustment is required. On weekends you have your own free time, depending on your family’s life styles. Personally I am very independent with respect for my family, being told “Take the key to the house. As I was entrusted with it. 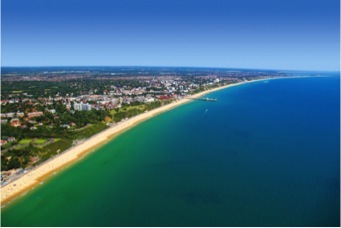 There are many things to do in Bournemouth, you can ride in the balloon, go to the beach (for the most brave, the water is cold currently). The shopping is amazing (there your happiness will bloom. It really is, i swear) .Or take a walk and appreciate the beauty of the town. But of course I’m not here on holiday, I ‘m here mostly for work, to develop my English and enhance my professional sector. This is where WCE steps in to help you find a suitable placement. Only after that you start the serious stuff. It will be full of different opportunities, an incredible human experience albeit with difficulties ( Just the language barrier sometimes huh … ) but truly positive and memorable, and I feel it has made ​​me more mature as a person. By worldchoiceeducation in How we help you, Student Advice, The UK, World Choice Education on October 9, 2014 .